It is unbelievable that I took so long to finish these simple pants that I started work on in May this year. You would think I should have had them finished in the span of a few days at the most. 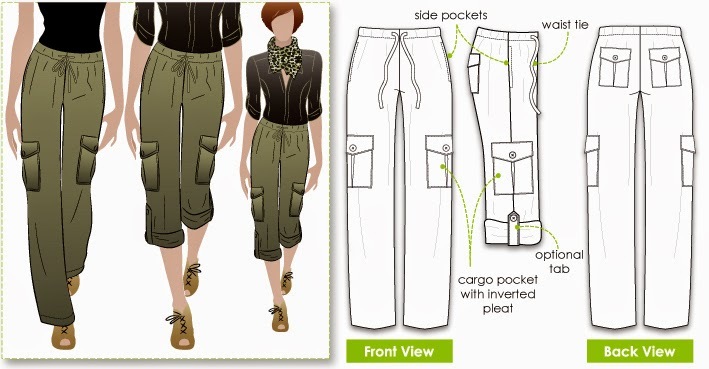 I fell head over heels for These Style Arc cargo pants the moment I saw them...but when I started working on them, I just lost interest because of the amount of pockets. But that isn't the total and only reason it took so long. I ended up having to move the pockets after they were completed. 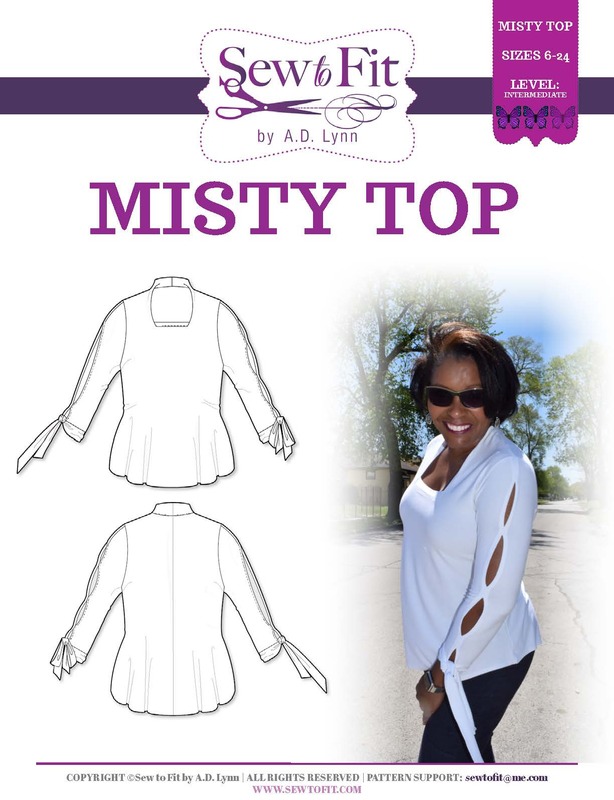 You notice on the picture from Style arc, that the back pockets sit rather high up on the hips. Well that was the problem for me there. I probably should have check the placement before I stitched and topstitched. 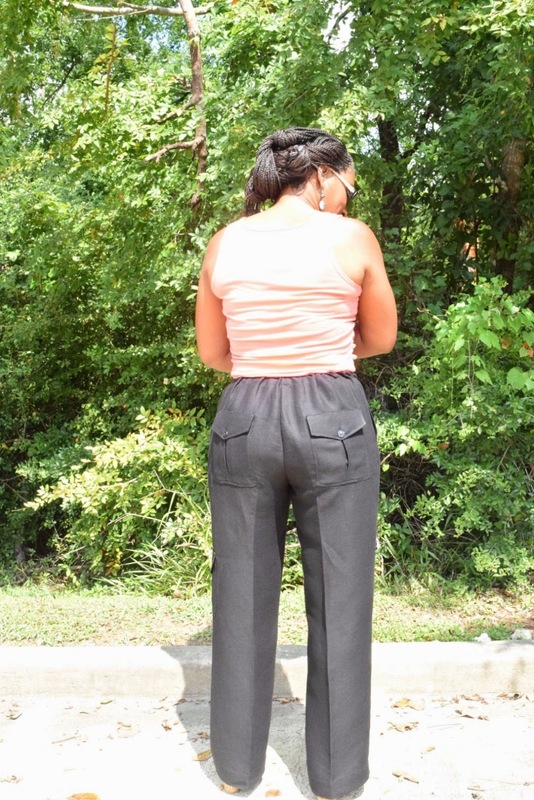 This is a Safari style straight (no flare) leg cargo pant with drawstring and box pleated pockets with flaps and functioning buttonholes. The patterns come in single sizes, thus, I ended up cutting a 16. 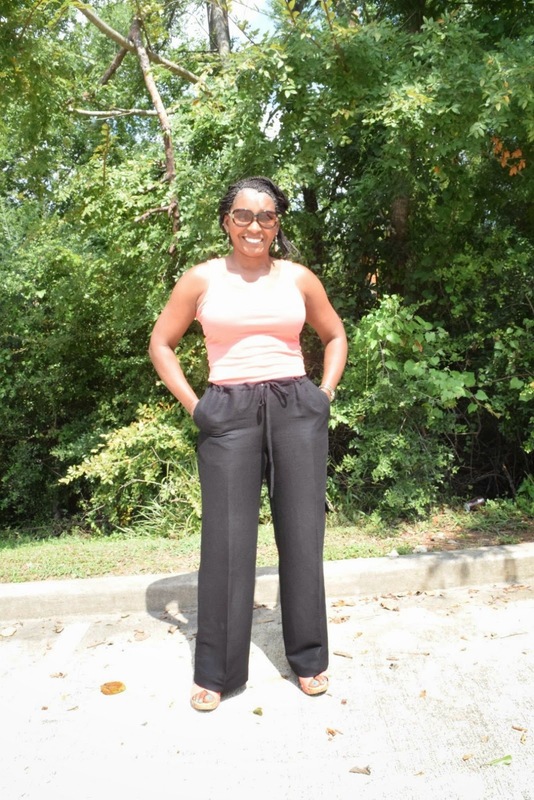 Compared to the pictures on the Style Arc website, the pants should fit right at the hip, however, in this case they are rather high in the front. I have to consider that my front rise is much lower than the average, so this part I overlooked. Even after taking 1 1/2 inches from the front waist, you can see that they still sit pretty high. As for the hang, they really do hang rather well, and that is what I like most about these pants. 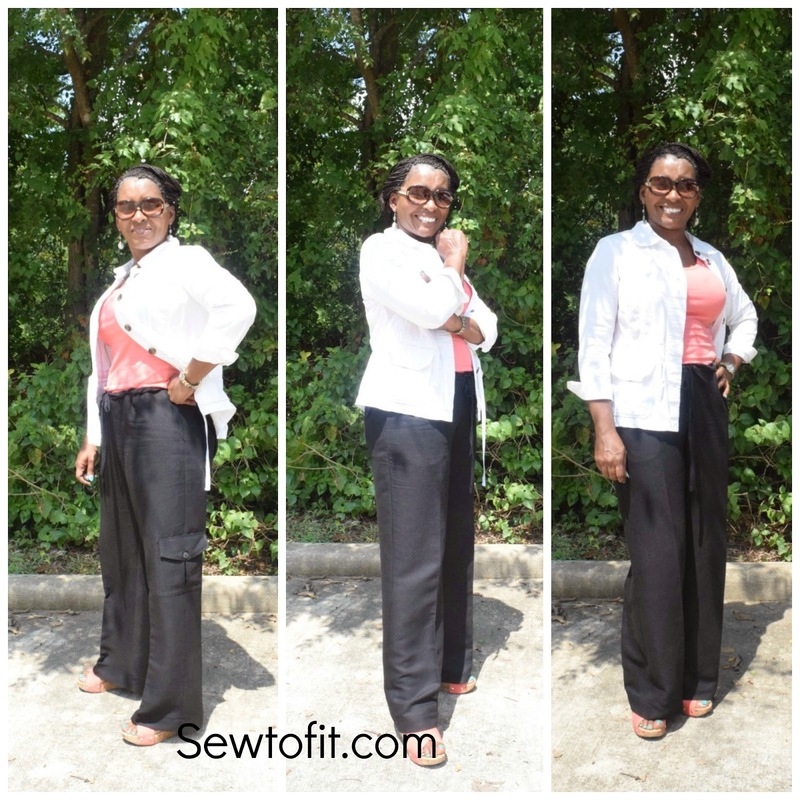 I decided to style the pants with a similarly relaxed type of jacket...my favorite summer ready white safari jacket. It has its own type of wrinkle look going on so, I felt really comfortable when going inside the office building. It was kind of dressed up but still dress down. I used a lightweight linen. A note regarding the fabric::: the only reason I washed the fabric is because they are for daily wear, otherwise normally I would dry clean my pants. I do not like to lose the sheen in any of my fabrics, especially linen, sateen, and silk duping. In the case of this fabric, I think it has a little poly blend or something, because they did not wrinkle nearly as bad as I thought they would. I got the fabric free from my school several years back. Another reason I suspect poly is because there was hardly any color loss. Regarding the back pocket placement, I wasn't too impressed...the position on the pattern puts the back pockets quite high up into and too close to the waist gathers. This made them look really bulky and caused the pleats to spread. On the pattern envelope, the gathers are not as full as are on me. The crotch was on point for me, and the leg width is absolutely to die for. The pants are cut more on a straight of grain along the side seam, which in my humble opinion helps for the inner leg and crotch to be on mast a bit of bias like jeans, to fit curves of the body better. The hip was perfect, but there was just too much fabric bunched up around the waist. 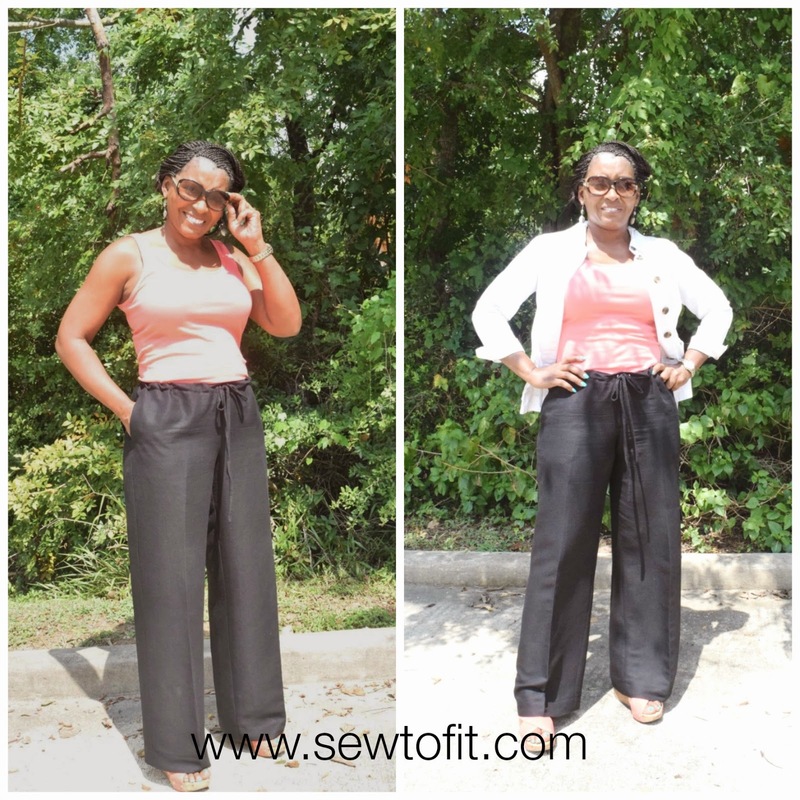 It seems like I made a lot of changes for a seemingly simple pair of pants. 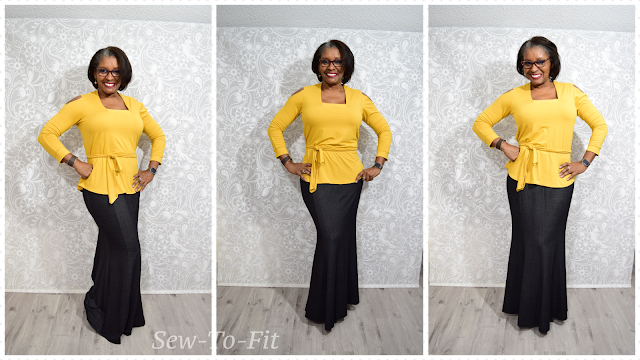 I was a little disappointed at how many changes I had to make, but I was really happy with them in the end, although, I plan to change the waist to be sewn on with stitched elastic and insert a drawstring next time I make them. Pockets usually cause a problem because of my thighs...I won't be using them much anyway. 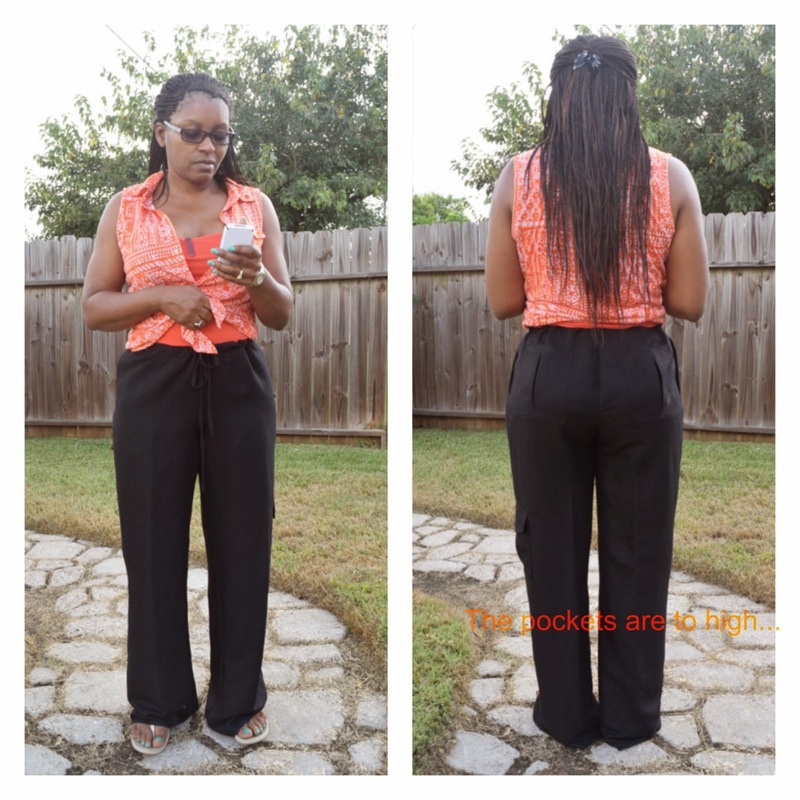 The front pockets were cut wider at the top to sew in the waist seam closer to center front. Deepened the crotch by 1/4" in the back. lengthen the pant 1 3/8" to wear them a little longer and then had to take out again, because I decided to let the pants sit low on the waist. Increased the back rise by 1"
Lower the front crotch by 1 1/2"
Lowered the position of the back pockets by 1.5" because the pockets were getting pulled up into the waist gathers. The only reason I would recommend these to others is because of the way it is laid on the fabric and consequently hangs on the body. 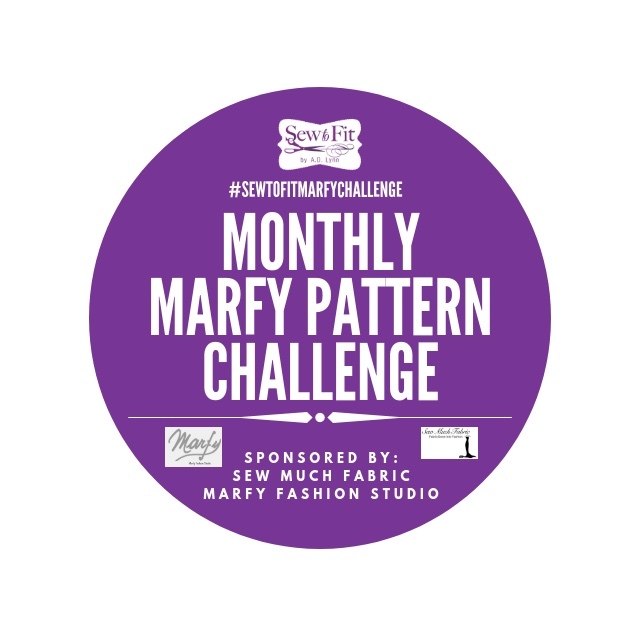 This is my go-to casual pants pattern. I omit all the pockets and have made these in white linen for the summer and also as PJ bottoms. I was glad to read that you liked them too. I can understand your frustration with the back pockets and gathers. I think the placement really flatters you from the behind though. I agree there seems to be a lot of gathers but it hasn't bothered me as my tops are longer and cover the gathers nicely. 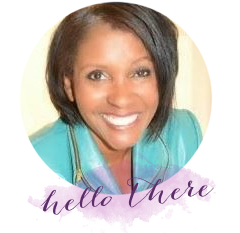 I love your blog and the things you make. Those back pockets are what enticed me, but I forgot about my gifts in the back. Thanks for stopping by, and I hope to have you visit again. I to forget to check pintetest for my pinned inspiration pics. Now I print my boards and put them in my lookbook binder. I like them! You look summer chic. I love the pants and you did a great job. I have a problem with drawstring pants too. I sometimes do a mock drawstring by inserting wide elastic across the back waist and attaching it to a shorter drawstring on both sides of the waist (so that only the front is drawstring) then I tack the elastic at the side seam lines to keep it from shifting. Hope this is helpful for you. 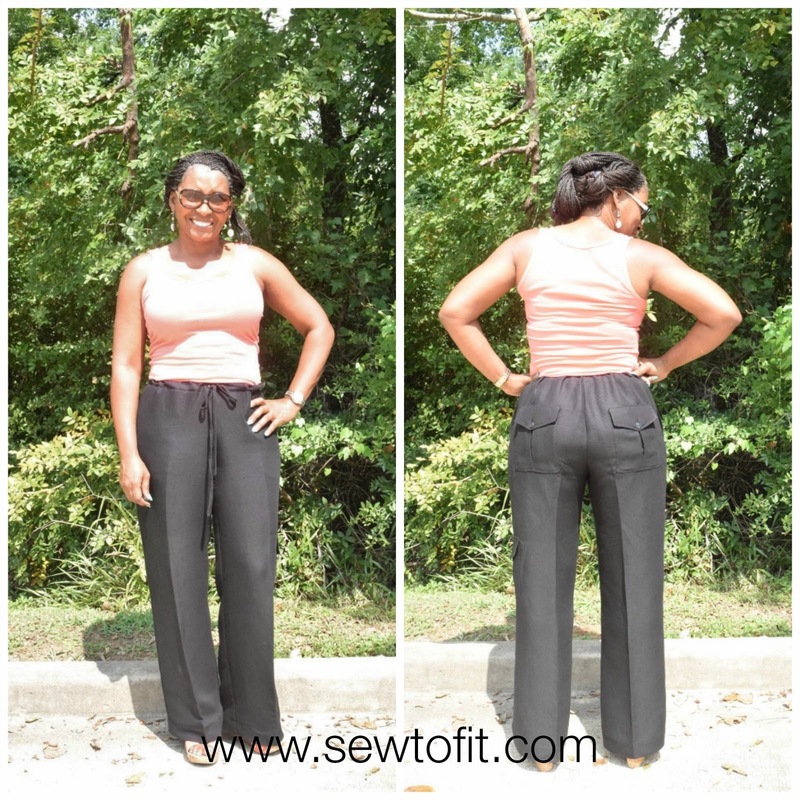 They are still a very flattering pair of pants and a versatile go-to pattern. I have tried the mock drawstring with the elastic, but it has not given me the waist support I like. Do you know of some strong elastic that you can suggest? Thanks Robin, I will source that for the next pair. 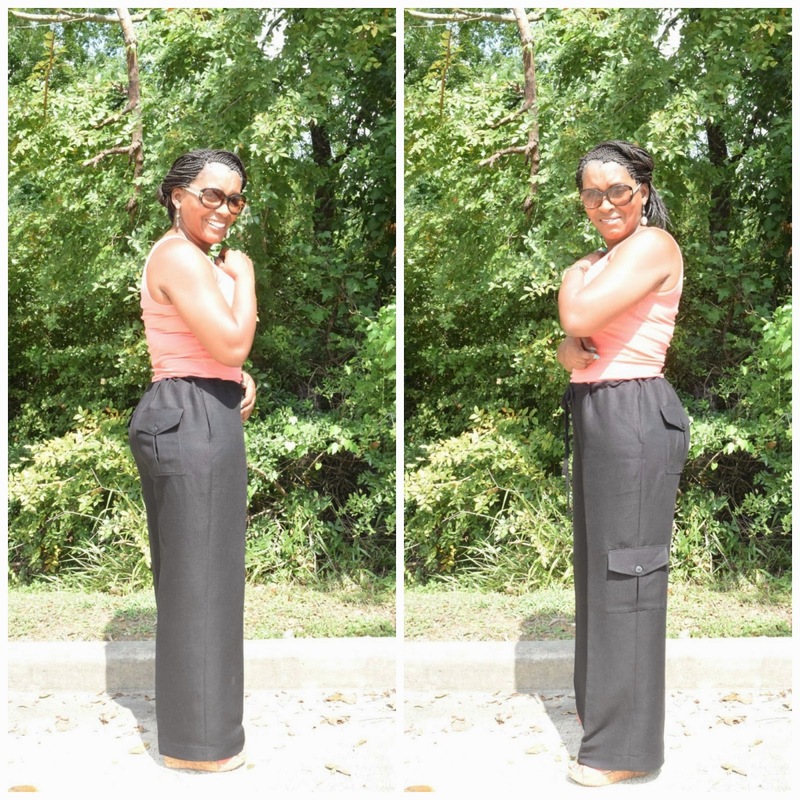 Awesome pant and like the wide leg detail of them. Looks great with the safari blazer and tank. I really like these. Nice fit.